Humans are a resourceful lot, and ever since the beginning of recorded history they've exercised their remarkable mental capabilities to come up with new ways of amusing themselves. This page details those sports and leisure activites popular among the citizens of the Twelve Colonies. A makeshift but regulation-size Pyramid arena. 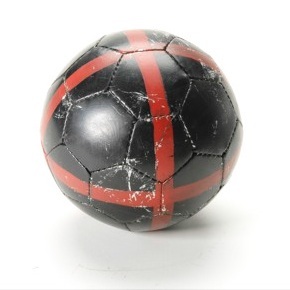 The objective of the game is to score points by getting a ball into a goal, or the "head." The head is located at the center of one edge of an equilateral triangle with edges of twelve feet. Backboards are located at the vertices of the triangle and at the other central edges. Teams consist of twelve players, though only three may be on the arena at any given time. It is common for athletes to rotate on and off the court between plays. The ball is the size of a cantaloupe and weighs approximately half a pound. 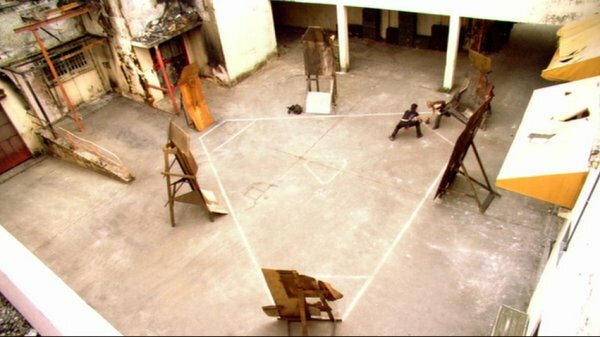 At the start of each match, each team starts in one corner of the triangle while two of their players "face-off" in the center of the arena. Players can take no more than three paces without passing, shooting, or rebounding ("banking") the ball off of one of the walls. The outlined areas in the corners and the center of the arena are neutral zones. When a player is in one of these zones, other players must back off and may not make contact. Full contact is allowed when the ball is not in a neutral zone. Once a player has been tackled, they must pass the ball. The game is won by the first team to score a certain number of points, most commonly 21. Each tournament match consists of a maximum of five such games, with the first team to 3 games declared the winner. The small size of the ball and the cupped design of the head makes shots from the sidelines quite a bit more difficult. However, the closer to the center of the arena a player gets, the more defenders can converge. Some teams favor large and physical players capable of battling over and winning the good shooting space directly in front of the goal; others feature deadly accurate shooters who can convert those difficult outside shots. Polaris has devised a set of rules using the MUSH's FS3 system for use on the IC grid. They are based on draft rules created by Radcliffe's player. If you have any comments or suggestions, please contact him in the game! If Pyramid is the Twelve Colonies' soccer, then Triad is its Texas hold-'em. Virtually anything can be wagered: money, smokes, alcohol, even clothes. Small wonder that after the end of the world as we know it, Triad has only increased in popularity. OOC Note: Our coded Triad deck is in Battlestar Cerberus' Recreation Room, located on Deck 9.